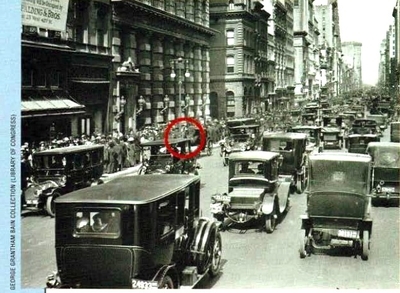 A New York street photographed in 1900 showed almost every vehicle pulled by horses. Just twelve years later, a photo of the same corner showed mostly cars. Few saw the complete disruption in transportation coming. Today, some experts, including Stanford's Tony Seba, argue that the efficiencies of solar energy and electricity storage technology have made quantum improvements in just the last eighteen months. These improvements threaten to disrupt the energy industry. The surprise is not the emergence of these disruptive technologies, but the speed with which they are coming on stream. By 2030, predicts Seba, all new energy will be provided by solar and wind. All new mass market vehicles will be electric. And there will be fewer of these vehicles, as autonomous vehicles make a dramatic mass entry into the market. "Oil, gas, coal, and nuclear will become obsolete," he argues. Assume that the demise of fossil fuels becomes a reality. What will be the economic and geopolitical fallout for the OPEC countries, Russia, Turkey, Africa, the United States, and Canada? How will the disruption of the automobile industry affect Germany, China, and Japan (with Germany and China now working so closely on electric vehicle development)? How, if at all, will NATO be affected? The Paris Climate Accord? If these predictions are correct, a lot of capital stock worldwide will become obsolete. Who will gain from new investment opportunities, and who will be stuck with worthless debt? Who will be the winners and losers? And how should today's policymakers plan for these potential shocks to the global system? Fifteen replies follow, from Marco Annunziata, Martin Neil Baily, W. Bowman Cutter, Andrew DeWit, Deborah Gordon, Gary N. Kleiman, Robert E. Litan, Edward N. Luttwak, Robert A. Manning, J.W. Mason, Wolfgang Münchau, Daniel Pipes, Roger B. Porter, Jeffrey D. Sachs, and Bret Swanson. Easter morning, Fifth Avenue, New York City, 1913. Note the one horse-driven carriage. The world's chief trouble spot, the Middle East, will be even more problematic. Burj Khalifa in Dubai, the world's tallest building, only partially built by carbon fuels. As the region with well over half the world's carbon fuel reserves, the Middle East is disproportionately affected by the price of oil and gas, from cases of extreme national dependence (tiny Qatar with its outsized global role) to ecological disaster (Saddam Hussein's burning of Kuwait's oil wells in 1991) to geo-political tensions (over eastern Mediterranean Sea gas). So, should the price of hydrocarbons collapse, the area from Morocco to Iran will be the most affected. Yes, some economies, such as those of Tunisia, Turkey, Israel, Bahrain, and Dubai, do not depend heavily on fossil fuels. Yes, some leaders, notably Saudi Crown Prince Mohammad bin Salman, realize that the rentier model cannot be sustained and seek to diversify. And yes, the demise of oil and gas will bring some good news: More water desalination plants, less Islamism (petrodollars basically fund it), and Israel's enemies weakened. But the negative implications of a gas and oil price collapse will be much greater. Foreign direct investment will shrivel. The majority of Middle Eastern economies will convulse. Regimes such as the Islamic Republic of Iran or the People's Democratic Republic of Algeria will not survive, leading to more anarchy (already rampant in Afghanistan, Egypt, Iraq, Lebanon, Libya, Somalia, Syria, the West Bank, and Yemen). Disagreements over access to scarce resources will spur new conflicts. Guest workers will return home in droves, upsetting those economies. Economic and other migrants will pour out of the region, headed mostly to the West, further upsetting the politics of Europe. Key airline and shipping routes will be disrupted. U.S. disengagement will enable nuclear weapons programs. In brief, the world's chief trouble spot will retain its role, only more so. Attention to the Middle East, still the world's premier irritant, will continue long after the decline of oil and gas.